Join Team Lightning and Cycle Nashville for an Intermediate Bike Ride featuring some of Nashville's favorite taco spots! Help us celebrate Cinco De Mayo with this biking event all about exploring Nashville's best taco spots! Grab your bike & appetite for this intermediate 18 miler all over Nashville! 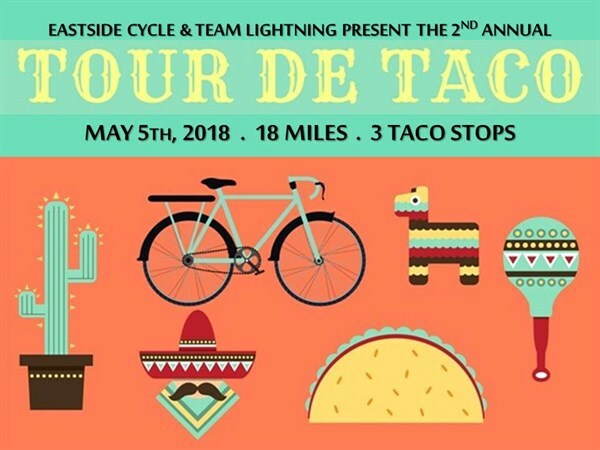 Tour De Taco will have four taco stops consisting of: Mas Tacos (East), San Antonio Taco Co., Local Taco (Murphy), and Sevier Park Fest/ Halycon Bike Shop (12 South). This ride will begin at Eastside Cycles and finish at Sevier Park Fest in 12 south. We will ride at a moderate pace, this is NOT a beginner friendly ride. Cost: FREE to join this group ride, bring cash for tacos (remember tipping brings good karma)! Difficulty: This is an intermediate ride. Participants should have prior (recent) experience riding the target distance for this event. Check out our Road Cycling Checklist, also available on the left column throughout our site! Registration Deadline: Please register for this event by Friday, May 4th at 12pm. Group Size Limit: This event is limited to 20 participants and 1 trip leader. Children Policy: This is an 18 and up event. Weather Policy: This is a shine or drizzle event. This event will be canceled with heavy rain prior to or during the event. Your trip leader will contact all RSVP'd participants with a weather update the day of the event. Cancellation Policy: If you RSVP'd but can no longer attend, please email TeamLightning@Lightning100.com to open up the spot to another participant. Meet up at Eastside Cycles prior to 12pm to check in with the trip leader and pick up any last minute biking needs. Each participant should have a bike tool bag with a spare tire, bike multi-tool, tire levers, and CO2 cartridges or hand bike pump (also check out our Road Cycling Checklist). We'll start with a quick overview of the route, go over cycling safety tips, group ride etiquette, and get ready to ride! Helmets are strongly encouraged. A helmet cannot be provided for you. Participants over the age of 16 without a helmet will be asked to sign a helmet waiver. We will be using hand and verbal signals during the ride to communicate with other cyclists, pedestrians and vehicles that we share the road with. Pass along the hand and verbal signals to other riders in our group by repeating the signal. Ride as far to the right as possible, except when passing debri or other users. Always pass on the Left. Ride no more then two side-by-side when the path is clear, and ride single file to allow vehicles to pass (not applicable in Bike Lanes). You must register for this event in order to recieve important event updates! E-mail TeamLightning@lightning100.com with any questions!